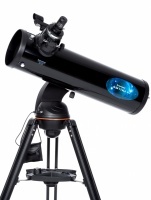 Selected Celestron telescopes have free items with them for a limited time. Depending on the scope, there is either a dew shield or ThermoTrek, plus a NexYZ smartphone adaptor completely free of charge! Simply click on the telescope, then note the free items on the right hand side. When you add them to basket, the 2 free items will show at zero cost! Please note this offer is only available while stocks last. Celestron isn’t changing the way we experience astronomy, but is definitely changing the way you interact with the night sky. 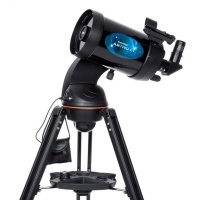 The Astro Fi 130mm Newtonian is a fully featured telescope that can be controlled with your smart phone or tablet using the free Celestron SkyPortal app. Celestron is not only changing the way we experience astronomy, but we're also changing the way you interact with the night sky. The Astro Fi 5 is a fully featured telescope that can be controlled with your smart phone or tablet using the free Celestron SkyPortal app.